Door material is an important purchasing consideration. 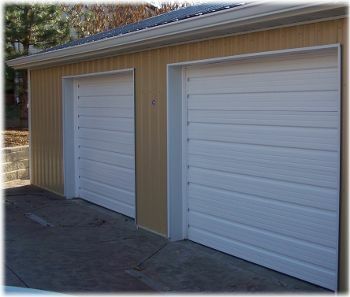 Overhead doors are available in wood, fiberglass, composite materials, and steel. 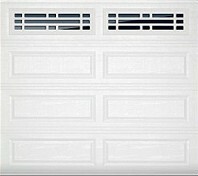 Cedar, hemlock, and redwood are often used for overhead garage doors, with cedar and redwood being more rot resistant. Painting or staining is required with any wood substrate to prevent rot however. Wood doors provide better insulation properties than a non-insulated steel door since wood is a natural insulator, steel is not. Most wood doors have no warranty on panels at all. Fiberglass, polymer plastic types, and other composite doors are light weight and some green products (recycled) are on the market too. They can get wavy in extreme heat and are somewhat brittle in extreme cold. 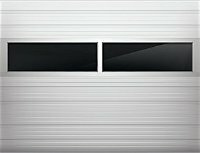 Steel doors are the most prevalent overhead door type sold and come non-insulated and insulated to various R values. Many colors and styles are available including decorative cross buck styles. Steel doors with one side, no steel panel on the inside, are called pan doors. Pan doors are not as strong as a sandwich door. 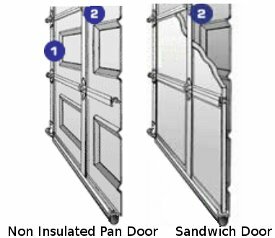 Sandwich doors are double sided, with a steel panel on the inside enveloping the insulation inside. Sandwich doors are generally quieter when in motion. As an example a 27 ga sandwich door with a bonded insulated core is stronger than a thicker 24 gauge pan door. A cut to fit insulation that is glued to the interior of the door skin. Even when cut precisely, this leaves voids similar to batt insulation in a wall or roof do. One of the biggest mistakes made with barn construction is spending money on high R value insulation for walls and roof and going cheap on overhead doors, thus leaving large un-insulated areas in overhead openings. An injected product, this fluid expands and foams into voids truly sealing your overhead door consistently providing the R value measured by thickness and formula. Overhead doors come in kits that must be built. Framing out the door properly is important for smooth operation, a tight weatherproof seal, and a long life cycle. The images on this page are suitable for garage door replacement problems too.